Last time we met (R7, 2018) Re-live our big win against the Giants at GMHBA Stadium last year. 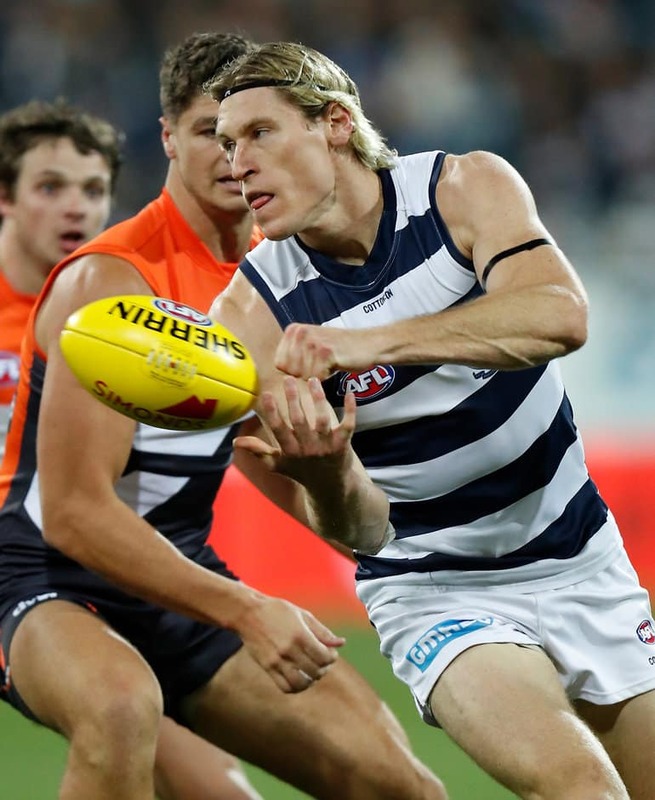 Mark Blicavs will play an important role for the Cats on Saturday. The last time Geelong faced the Giants at home they won convincingly. We look ahead to the key matchups for Saturday’s game between two of the premiership favourites. Cameron’s last game saw him tally 30 disposals, nine marks and seven goals. His dominance in the forward 50 could be the source of a major headache for Chris Scott. Although, the Cats boast one of the league’s best full backs in Mark Blicavs who is likely to play predominantly on Cameron. His elite one-on-one ability and running capacity could get the better of the key forward. Menegola earned the praise of midfield coach Matthew Knights after a fantastic game against Adelaide last round. Footage showed Menegola making up 80-90 metres in a very short amount of time to stop a certain set shot from 25 metres out. His work rate and physicality will challenge intercept defender Nick Haynes when they clash across half-forward. Both of these young guns have stepped up in new midfield roles. Taranto’s time in the midfield has been boosted by the departure of Dylan Shiel. All the while Ablett and Selwood’s relocation to new roles has helped Parfitt find time in the centre square. Taranto has a much bigger frame, but Parfitt’s agility makes him very hard to tackle. Hopper has enjoyed a strong start to the year, also being the beneficiary of more midfield time like Taranto. He kicked two goals and had 29 touches in the Giants’ strong win against Richmond. Although, Constable has averaged 25 disposals and a goal over his first three AFL games. He might not have the bulk of Hopper, but he’s proven to be a strong contested ball-winner. Lachie Whitfield has continued his outstanding form from last season, leading the league in marks and uncontested possessions. He is also second in total disposals, executing at 77% disposal efficiency. Lachie Henderson said in his guest role on ‘To The Final Bell’ podcast that it’ll take a group effort to negate his impact. Whitfield will have a target on his back from new pressure forwards like Gryan Miers, Tom Atkins, Gary Rohan and Luke Dahlhaus. Dahlhaus’ pressure has been outstanding, as he currently sits third in the league for total tackles.